She's only 15 but ready to take on the world! 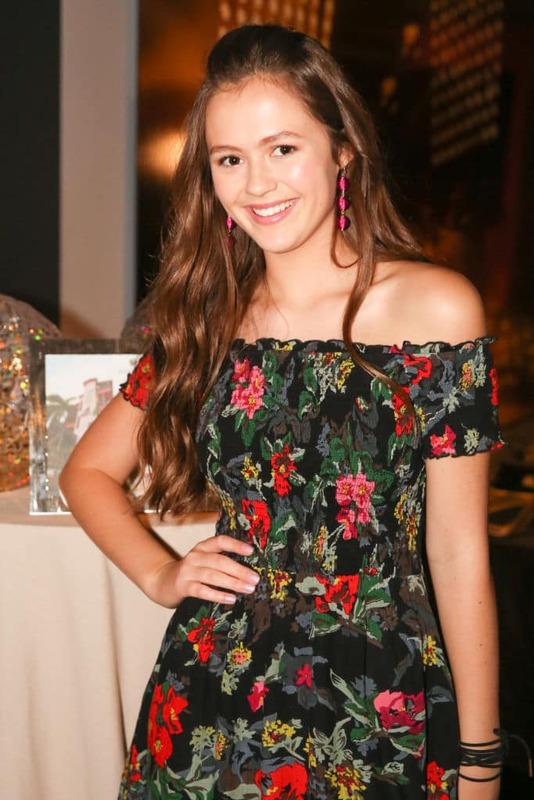 Olivia Sanabia may be an aspiring teen pop star, actor and high schooler who loves math, but she is also more than determined to make her mark in films, music and Broadway, years down the line. From doing a campaign spot alongside Jennifer Garner when she was eight years old to now starring in an upcoming Disney comedy television series 'Coop and Cami Ask the World', premiering on October 12, the Southern California native has garnered a strong fan base for her artistic performances, especially in music. Meaww catches up with the rising star to talk about the upcoming hilarious and emotional Disney show created by Boyce Bugliari and Jamie McLaughlin while also sharing about her personal life, philosophies and the immense pressure of juggling her education and career. "It's all about priority," she says. Ever since your breakout role in Amazon Studios television pilot 'Just Add Magic' as Kelly Quinn, what aspects of your life has changed? I feel half my life has changed and the other half hasn't. What has changed is the part where I am filming because I am devoting a lot of my time on working on my script and promoting the shows, but I love it because I am getting to do what I love. When it comes to family and home, nothing has greatly changed. So I'd say some aspects of my life have changed but not everything. You started your career with singing. How did that lead to acting? Singing was my first love before I discovered acting. But I think something that was always embedded in me was that I loved to perform for people. So regardless of what it was, I think I was acting while I was singing. I would do these performances wherever I was, be it a place I'm just full out crazy or a place where I would be quiet - because I love to be a performer. I started musical theatre, which combined singing and acting for the first time and then I discovered that I loved acting as well, so that is when I decided to pursue it. The biggest inspiration for me was my parents because they always pushed me to do whatever I loved and go wherever my passion was. Without them, I wouldn't have been able to pursue these dreams of mine. Now that you're officially a part of the Disney family, how do you feel? I feel it's a duty. I feel like I have some weight on my shoulder because it's a legacy. Disney channel is a legacy that has been going on for so many years and something that as a child, I relied on. I remember tuning into Disney channel after I watched something scary because I knew it would make me laugh and smile. That's what Disney does for you. If I were given the opportunity to make other kids smile then that's something that I don't want to take for granted. What was your favorite Disney show growing up? I had a couple of favorite Disney Channel shows. My first one was 'Goodluck Charlie' and I remember just being involved with the show. It made me laugh all the time and I used to watch it with my family so that was something that really made it special. I also loved 'Hannah Montana', because, I knew that I wanted to be a performer and the kind of double life that Hannah Montana led was just amazing. Who is your favorite Disney star idol? You know there were so many amazing women who came out of Disney Channel. Selena Gomez was always someone I looked up to because she is so amazing, beautiful and strong as well as a kind young woman. I love how she inspired young girls and continues to even till date. I love how she stays in her path because she knows her audience and she is aware that she can reach young girls. She is trying to do her best and be a good example for them. I love that about her. Have you met Selena Gomez or been to her concerts? I haven't and I would absolutely love to. I have friends who have seen her before, and even that news made me excited. I've followed her for so long and I feel like I know her. It will just be crazy to meet her. Tell us about 'Coop and Cami Ask the World' and your role there. So the show is about this family of five and there are four kids on the show. Two of the kids have this live-streaming web show where they ask their fans 'Would you Wrather' questions. The show also focuses on this family and all the crazy things that happen because of these "Would you Wrather" questions. Those questions can be anything, including jumping in the pool, so there are a couple of stunts as well. There's also these emotional family moments and that's something I love about this show. You play the role of the eldest sister Charlotte Wrather. Do you relate to being the eldest on set? I am one of the older kids in my family and I can definitely relate to Charlotte because I love my siblings so much that I take on the 'mother' figure in their lives. I can also relate to Charlotte because she does have a big family and she needs to take on the motherly nature. But there are several other ways that I don't relate to her. She is a little more headstrong than I am and when she sets her mind on something, no matter how crazy it is, she will sail through it. She takes things seriously and sometimes too seriously. Sometimes it's hilarious. She is just a teenage girl trying to find her way. Do you want Charlotte to come across as a strict elder sister or a warm character? What do you want the audience to feel about her? What the audience will see about Charlotte is that she loves her siblings and would do anything for them. But I also want people to see that she has so many other interests and she's her own person trying to do what she loves and her passion is music, violin, and singing so I can definitely relate to her on that one. It's pretty cool to see her visions. She is very determined and has goals for college. Tell us about the other cast members and characters. There are four of us kids in total and then we have the mom on the show. All of us bond really well. We laugh a lot, hang out on sets, and do a lot of handshakes. We feel that we are actually siblings and that's super important because we are spending so much time together and we are learning about one another. It's been great. Who is your favorite character besides Charlotte? That's a hard one. I think every character brings something different to the table. I think it's a team effort to make all the craziness, but somebody who consistently makes me laugh is the character Fred, played by Albert Tsai, who is just so funny. We love him so much. He is hilarious. In general, being an actress and a singer, I get to emotionally affect people in some way. I love doing comedy on Disney Channel and make the kids laugh. But I also love to do some serious acting, that can move people to tears because that is something beautiful when you can move people with your story. It's important for me to make people feel something when they finish watching the show or when they finish listening to a song. By then I'll be an adult and things will change a lot but I have a lot of goals and ambitions. A couple of them include me entering the film world even more. I want to explore films while also experiment with my music. I also love Broadway so I'd like to see myself there as well. It's hard to say now where my path is going to take me. When it comes to films, would you like to explore any genre in particular? I love drama, I love doing emotional films and telling true stories, so I'd like to explore that, especially where girls and boys can relate to. As long as I can inspire someone with my character and somebody else benefits from my job then that will be great. You did a campaign alongside Jennifer Garner when you were eight. What is your fondest memory from the campaign? Do you follow Garner on Instagram? I love watching her and everything she does. I watch her interviews and she's so inspiring. I love her even more now that I am older and have watched more of her films. I do remember working with her because it was my very first job. I remember being so excited and not really knowing what to expect. The first thing I recall is that she was so loving and welcoming that we were just sitting there, laughing and talking about stuff that was not scripted while pictures were being taken. We were just giggling and laughing and eating in the sand and really enjoying being with each other and at that time I did not even realize the magnitude of how amazing Jennifer Garner was and is. So, now if I could go back I'd ask her a lot of questions. Do you want to act with her again? Absolutely. I would love any opportunity to see her again and hopefully to work with her. That would be amazing and I would gladly take anything to work with her. How would you describe your journey in one sentence so far? It's a roller coaster ride. That's all I can really say. There are a lot of ups and downs and I've been in the business for eight years now and there are things people don't see behind the camera. It's a hard business to be in but there are also amazing moments. For example, a fan mail that said "thank you so much. The show made me smile," and honestly that's all that matters. There are also hard things too and it's easy to assume through Instagram that things are just easy. Social media is often a highlighted moment of good times and there are also hard moments but overall I've been so lucky and grateful for the career I've been able to have. I am very hopeful and ready for what the future has in store for me. What do you do when you're under pressure? How do you cope with a very difficult situation? I am an independent person and I like being able to solve problems by myself but at the end of the day, I like to go back to my family. They always make me feel better even if there's nothing they can do about a situation whether I am just nervous about a school test or about an audition. They help me and put me at ease. Even my friends do that for me. They are the most important people in my life, the people that can make me feel good even if things are stressing me out. So would you say your biggest supporters are your family and friends? I would say that hundred percent. My mother and father have been so supportive and amazing my whole life and also throughout my acting journey. My siblings and friends have really supported me, they know who they are and I love them so much. Is there music coming out soon? Yes, I am working on some music right now but can't say much. How do manage school, acting and music? Does it get hectic? Yes, it does. I have to prioritize and make sure that my education comes first and you know a being a high schooler and having tough subjects right now, I am just working my best to get them done. While also having to work for my life and just prioritizing and ensuring what needs to be done gets done. Is there anything more you'd like to say? Stay tuned for 'Coop and Cami Ask the World' coming out and also stay tuned for music and fun things.